A solid base of physical strength can take years of consistent training to develop. However, with concerted a effort, it's possible to see quick improvements. Whether you're preparing for a competition of some sort or just want to increase your level of fitness, following a few simple steps can speed up your strength-gaining process. Etch out a training program. As the saying goes, if you fail to plan, you plan to fail. Think about what your goals are and create a program based on achieving them. 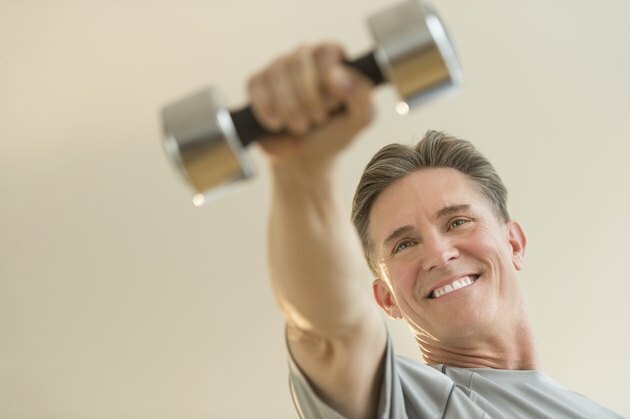 If you're new to exercise, consult a fitness professional to help get you started. Visualize every rep. When you're training with weights, it's paramount to give a 100-percent effort on every repetition, especially during the last couple of reps with heavy weight. The moments when your muscles are screaming out at you to stop are the times when it's most important to continue. Before you give up on a rep, visualize yourself finishing it strong. You'll be impressed by your own strength. Lift heavy weights. In order to force your body to become stronger, you have to give it stimuli beyond your current level of fitness. Training with heavy resistance will break down your muscle fibers and encourage the remodeling process, resulting in stronger, bigger muscles. For strength gains, try keeping your heavy workouts range around three to five sets of five to eight reps. Vary your workouts. Your body is constantly working to adapt to your training efforts, and if you don't consistently change your workout types and intensity levels, you're destined to hit a plateau. Keep your body guessing by incorporating a variety of training styles and equipment. Don't allow yourself to fall into the rut of performing eight to 12 repetitions of the same exercises for each body part. Instead, use heavy weights one day and light resistance the next while making use of different pieces of equipment, such as free weights, machines, cables and kettlebells. Get adequate rest. When it comes to building strength, allowing your body ample recovery time is just as important as your training efforts. Aim to get at least eight hours of rest each night to provide your body with the opportunity to repair muscle fibers. According to the American College of Sports Medicine, adults should rest at least 48 hours between resistance training sessions for the same muscle group. Push yourself by training with someone stronger than you are. Pick a workout partner who has already achieved goals you're trying to. Also, document your training. Keep a workout journal and record the weight, sets and reps for each exercise you perform. It's a good idea to make note of how you feel after each workout. A training log is an excellent tool to have in your arsenal when you need to be able to tweak a program to maximize results. Always remember to check with your doctor before making any changes to your exercise routine. Always use a spotter when training with resistance. Pay special attention to your form and follow through for every rep.